It seems like the “minimalist” deign has become extremely popular in recent years. It has taken over the new watch industry, with companies popping up left and right with similar designs. While established brands continue to stick to their proprietary designs, companies that are coming into this competitive market lean on the “Bauhaus” design in an attempt to break through the competition. Some brands (which I won’t mention by name) have had incredible success with these designs and a fantastic marketing team behind them, firing on all cylinders. Mostly, this success has come due to non-watch collectors. I was initially drawn to Sternglas because of two factors: Their designed looked extremely well executed and because of the fact I had never heard of them (seriously). I keep my ear close to the ground when it comes to the watch world, and when I discovered this brand and realized I had never heard of them, I figured this was something worth looking into. It was. I finally have one in my hands. The Naos features a beautiful white dial, clean minute and hour marks, a date window, and, my favorite feature, blue hands. 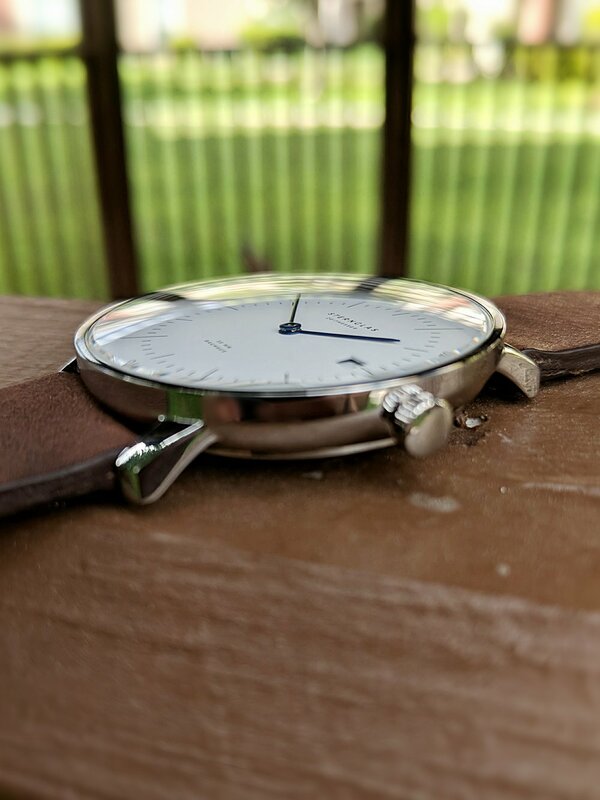 The domed sapphire crystal works beautifully with the thin design. All of this adds up to a fantastic dress watch. Handling the Naos, I am initially reminded of the Junghans Max Bill, a great piece I have in my personal collection. Both share a similar dial design, are extremely thin, and wear extremely similar. Let’s take a look at the specifications of the two pieces. The Naos comes in a great size of 38mm (same as the Max Bill), fitting perfectly with its clean design. It is 8mm thin (same as the Max Bill), which is perfect for a dress watch. 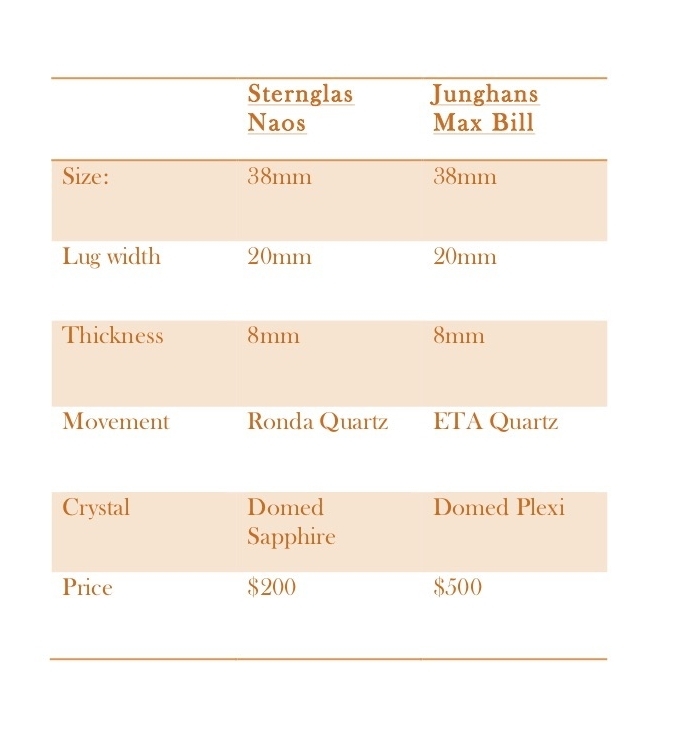 However unlike the Max Bill, the Naos features a domed sapphire crystal, versus Junghan’s plexi. The Naos uses a Ronda quartz movement, versus Junghan’s ETA quartz. 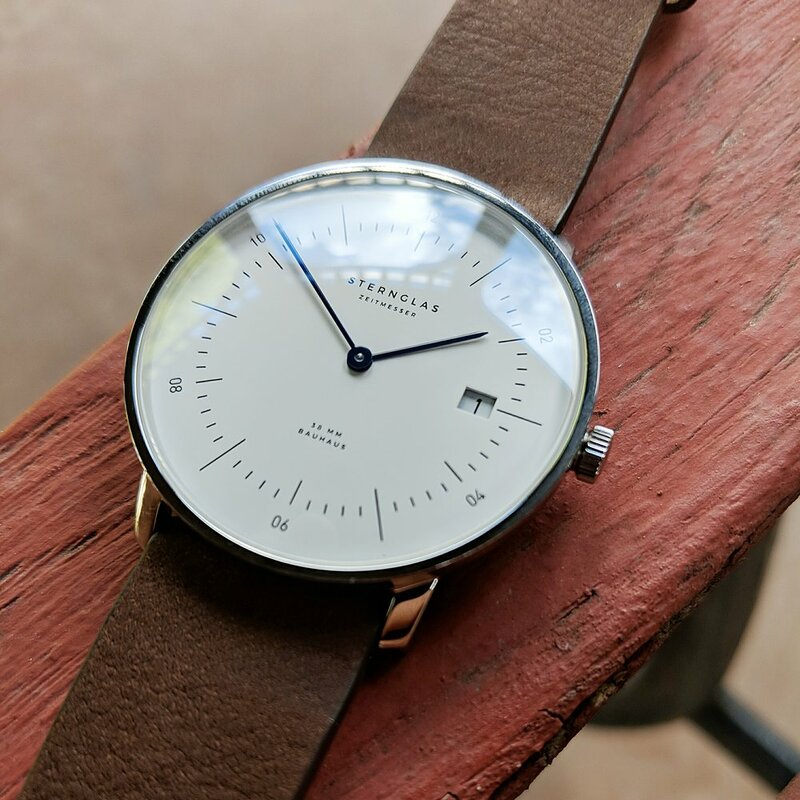 The Naos is priced at just about $200, while the Junghans is sold for over $500. While judging two watches by only the specs is unfair and misleading, this comparison says a lot about how much is packed into the Naos. · Sternglas does everything right with this design. The blue hands work beautifully with the white dial. The sapphire dome is enough to be noticed, but not big enough to take away from the minimalist design. Everything is in harmony. · The 50m water resistance allows for some good protection against water that goes beyond the splash-proof protection usually found in dress watches similar to this. · The price on this is great. At $200, I can’t think of many other options with such a clean design, quartz or otherwise. The Naos is a winner. It goes into an extremely competitive niche (minimalist designs) and is able to successfully set itself apart from tight competition. 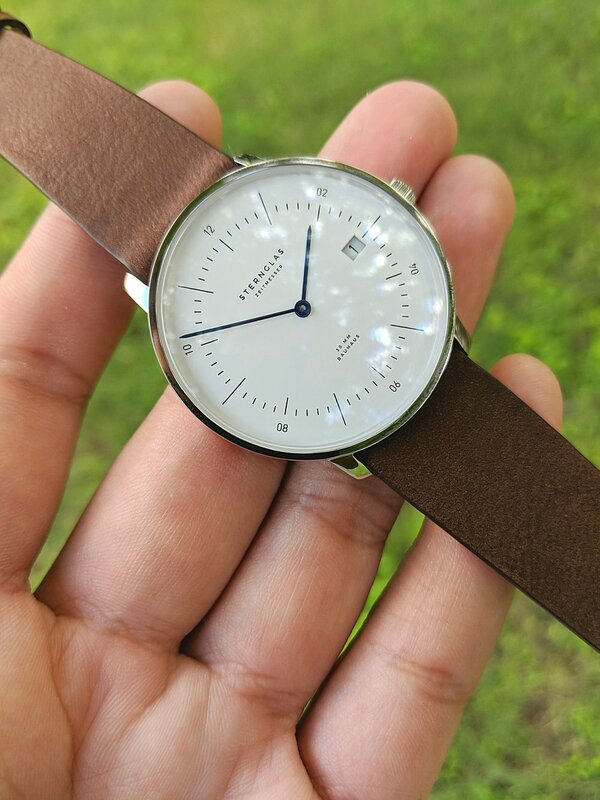 At this price (about $200), you can’t go wrong with this if you’re looking for a dress watch. To get your hands on a Naos, click the button below. Use the code AFFORDABLEWRISTTIME10 for some savings!